Only 2500 copies worldwide… When they are gone – they’re gone! In 2009, several boxes of never-seen-before photos of Hammer Films productions was archived by Hammer expert Wayne Kinsey for the British Film Institute. Kinsey and the BFI were so impressed by the collection, that it was agreed the best should be published. Through these rare and mostly previously unseen images, Hammer Films – A Life in Pictures tells the visual story of Hammer’s output. 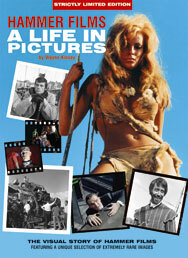 You will be guided through this wonderful collection of photos by Kinsey himself,the celebrated author of Hammer Films – the Elstree Studios Years and Hammer Films – the Bray Studios Years. Hammer Films – A Life in Pictures explores the wider and fascinating side of one of the British film industry’s greatest success stories, showing once and for all that Hammer was not just a purveyor of cheap horror pictures. In fact, they made films in a number of different genres such as war thrillers, gritty dramas, comedies and colourful swashbuckling adventures. Some of these were among their best films; 1959 is a case in point which included such classics as Never Take Sweets from a Stranger, Hell is a City and Yesterday’s Enemy, the latter of which earned Hammer BAFTA nominations for best picture, best actor and best supporting actor. Hammer’s films also benefited from an expert team of actors and technicians, including big names that on first glance would never have thought to be associated with Hammer including Robert Aldrich, Ken Adam, Joe Losey, Bette Davis, Tallulah Bankhead, Donald Sutherland, Joan Fontaine, Richard Widmark, Ursula Andress and Raquel Welch.